I've really neglected my skin the past couple of months - my whole skincare routine sort of went out the window and it showed. Dry, rough patches on my cheeks, forehead and nose as well as pimples on my chin were common problems. But I have some lovely bits on my bathroom shelf to help me get back on track. First up, Botanicals Mandarin & Chamomile Facial Polish* has been such a treat. This is a really gentle exfoliating cleanser that I can happily use twice a week. Made from natural and organic ingredients, this cleanser doesn't contain any water so it's solid in the pot. I rub my fingers into it and then massage onto my face, whilst it melts under my fingertips and sinks into my skin. Tiny rosehip kernels provide the polish to unclog pores, which are so delicate on the skin. If you're looking for a soft cleanser, with just a little exfoliation, I'd recommend this one as it never feels too rough. I've actually noticed a few less blackheads around my nose since I've been using it, which of course I'm thrilled about! 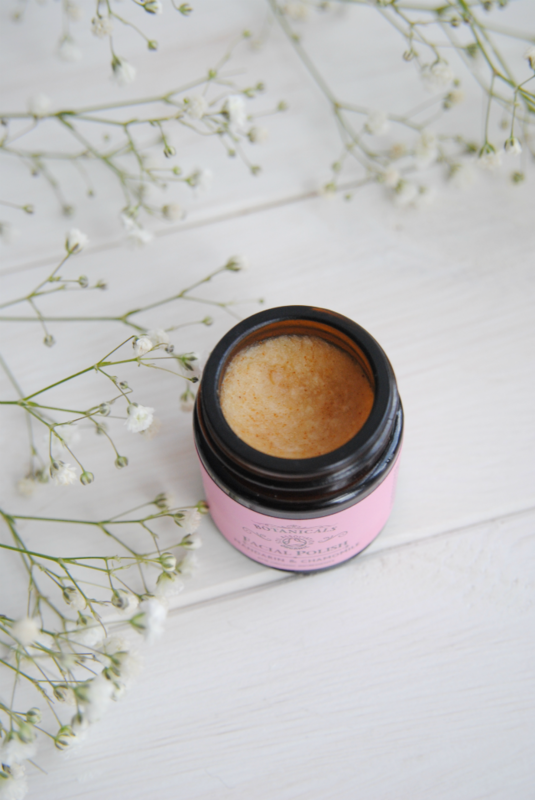 I let the facial polish do it's thing for a minute or two whilst I brush my hair, then take it off with a Pai organic muslin cloth. As it's completely natural, this cloth is a little coarser than the ones I've used in the past - however it really works to buff out my skin and leave it feeling smooth. It's held up to many multiple uses in the shower, but I will be looking for a second softer one that I can use everyday. 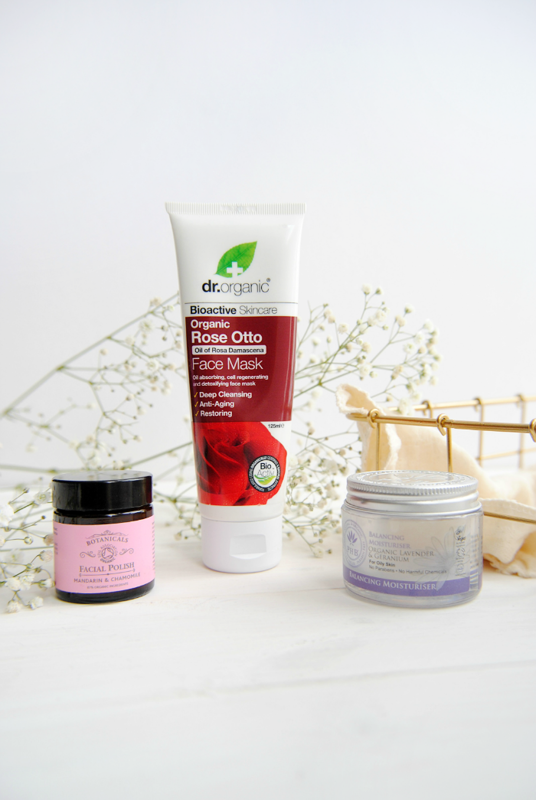 Once a week I also put on a generous amount of Dr Organic's Rose Otto face mask. This is another super gentle formula that certainly works to draw out any nasties from my skin. It dries quickly and I really like to layer it on so I also use my muslin cloth to take it off more easily. The first couple of times after using this mask I had a fair few spots appear, but now my complexion is much clearer. It has a slight rosy scent and is already helping to even out the redness on my cheeks and around my nose. I like to use it on a Sunday morning as part of my weekend pampering and relaxing. Lastly to hydrate, I've been using PHB Ethical Beauty's Balancing Moisturiser. I love the lavender smell and the texture is very creamy. I've happily been using this for about six months so I'm keen to try more of their skincare. This moisturiser works well for my combination skin but I still find I have a little shininess to deal with so no balancing miracles. However it does make my skin feel lovely and soft and helps with any pesky dry patches. It's another all natural find, handmade with organic ingredients and eco-friendly packaging, so bonus points from me. Plus 20% of the profits go to charity! This pot is nearly empty now, but I know it's going to be a little too much for my combination skin in the summer, so I'm currently looking for something lighter to moisturise with. I've yet to find a product or routine that completely battles both the dryness and oiliness of my skin but this line up is certainly helping. What are you loving for springtime skincare?